The Empire State Building is considered one of the Seven Wonders of the modern world, along with the Golden Gate Bridge in San Francisco. So the majestic, grand and serious Empire State Building is located in Manhattan in the metropolitan of New York. 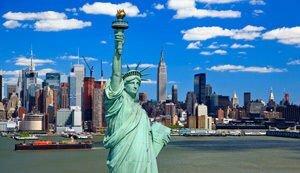 This embletic statue of New York is a feature of engineering in the U.S. and is named after the homonymous state, formerly called the "Imperial State". The building of the Empire State Building is located on Fifth Avenue № 350, between 33rd and 34th street. The construction of the Empire State Building was designed by the architectural firm Shreve, Lamb, and Harmon. The Empire State Building is the second tallest building in the United States after the Sears Tower in Chicago, Illinois. The skyscraper in Manhattan was built in Art Deco and officially completed in 1931 and opened at a ceremony by the then U.S. President - Hoover. The Empire State Building holds a record as it was the first building in the world that exceeded 100 floors. Over the whole 41 years the giant had no equal in height in New York, until finally the two towers of the World Trade Center were constructed. After the impact against the two towers on September 11th, 2001 the Empire State Building once again is considered the tallest building in New York. Large proportions of the Empire State Building includes, 102 floors, reaching a height of 381 meters. Adding the Broadcasting antenna the height of the Empire State Building reaches 448 meters. The 102-storey skyscraper has 6, 500 glass windows and the 73 high-speed elevators serve workers and visitors to the tower. 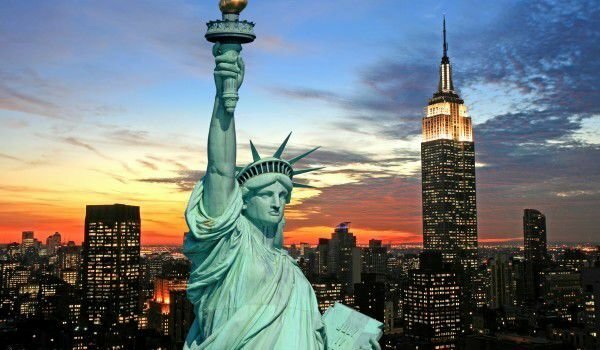 The Empire State Building occupies a total area of 200, 000 square meters and for its construction 330 thousand square meters of concrete was needed. The Empire State Building was built in a record time of 775 days, as the giant is the result of competition between car companies Chrysler and General Motors for raising the tallest building. Over 30 years of last century the outcome and the emergence of such a structure never existed anywhere in the world and the total spent for developing it was a staggering 41 million dollars. At that time it was incredibly prestigious and very expensive for a company to hire an office in the tower. To this day renovating the structure and inner workings of the Empire State Building is continuously updated, only the last six years for innovation inputs over 67 million dollars has been given. The building now houses offices, banks and famous observatories, appearing on the 86th and 102nd floor, which offers detailed and breathtaking views of the entire New York. Millions of tourists also visit the Empire State Building each year . On May 1st, 2006 the building celebrated 75 years of construction. On the second floor of the skyscraper you find one of its main attractions, namely the simulator, which was opened in 1994. When in it for about 25 minutes you can immerse yourself in almost a real aerial tour around New York. As one of the emblems of the largest U.S. city, the Empire State Building is often used as background images for very large-scale movie productions. Probably one of the largest representations of the huge tower was in the film of King Kong in 1933.